SDWR delivers Diabetic Alert Dog to 38-year-old man with Type 1 Diabetes in Los Angeles, CA. 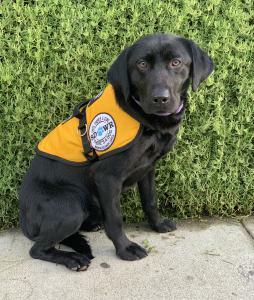 LOS ANGELES, CA, UNITED STATES, February 12, 2019 /EINPresswire.com/ — Luke, a 38-year-old man in Los Angeles, California, received a very special delivery today of his very own Diabetic Alert Service Dog from Service Dogs by Warren Retrievers. 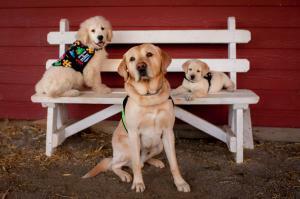 Based in Madison, Virginia, Service Dogs by Warren Retrievers, or “SDWR,” has a mission to provide specially-bred and trained dogs for people of all ages that struggle with living with invisible disabilities such as Autism, PTSD, Seizure Disorders, or in the case of Luke—Type 1 Diabetes. SDWR has hundreds of working service dogs placed around the globe and is currently serving approximately 1,000 families. Baldwin is also an honored graduate of the SDWR Fallen Officer Puppy Program. The Fallen Officer Puppy Program, also known as “FOPP,” is an initiative by SDWR to pay respect to the legacy of service by fallen American police who sacrificed their lives in the line of duty. Baldwin is named in honor of fallen hero Sergeant David M. Baldwin of the Jefferson County Sheriff's Office in Colorado who was killed when his police motorcycle was struck head-on by another vehicle. Baldwin’s work as a Diabetic Alert Service Dog with Luke will carry on in memoriam of Sergeant Baldwin’s life of service before self. To make a donation or learn more about SDWR, please visit the website, www.sdwr.org. To learn more about Diabetic Alert Service Dogs visit www.sdwr.org/service-dogs/diabetic-alert/.